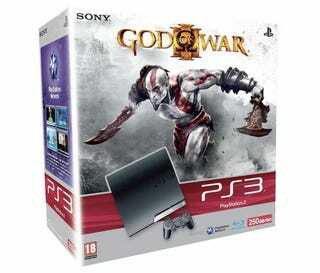 This is a God of War III hardware bundle for the European market, first hinted at yesterday, now with its cover completely blown. Just like the Heavy Rain bundle, this one costs €350 (USD$500), and includes a 250GB console, controller and a copy of the game in question. Amazon France also reckon the bundle will be out on March 17, which if correct would thus be the game's European release date.